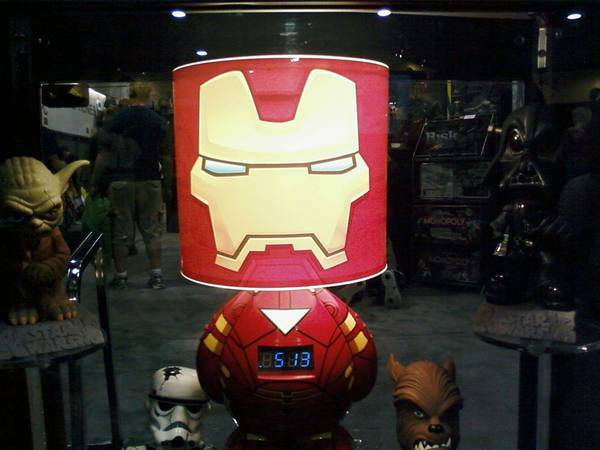 And look at this adorable Iron Man lamp! He'll bite your legs off! Ooh, I hope metal lunchboxes are making a comeback. Such retro goodness. The fork is a great touch. D'awwww. Now that's raising your kid right! Great pics! I always love to see con pictures. It's amazing how creative people are. Love all the pics. Especially that last one. We were a Jedi family for our daughter's 2nd Halloween. She made a great Yoda. I would so love to go to this Geek Heaven one day. We have that baby Yoda costume! Our second son will wear it this year! Coming from a Con-Mom, I'm loving your pictures. You can keep stalking all you want. We'll keep enjoying it. Keep em comin', keep em comin'! I LOVE all of these pictures. 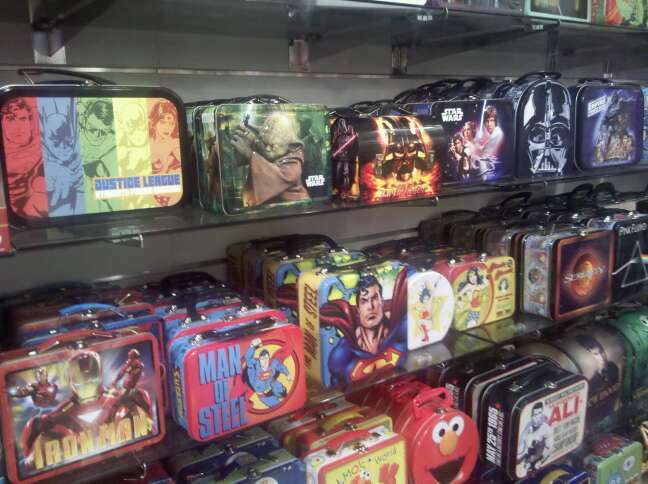 I remember when they switched lunch boxes from the metal to the plastic. The metal ones were deemed too deadly a weapon in elementary school close combat. 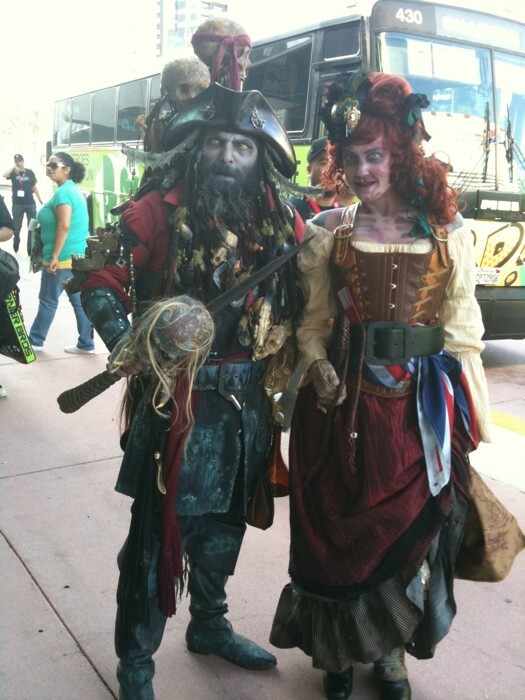 Those pirate costumes are AMAZING! and how cute is that baby yoda! 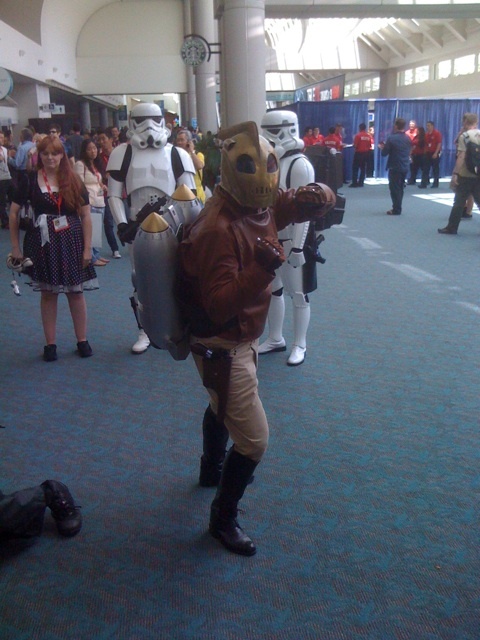 This is so making me want to go to a comic con - not a fan of big crowds. 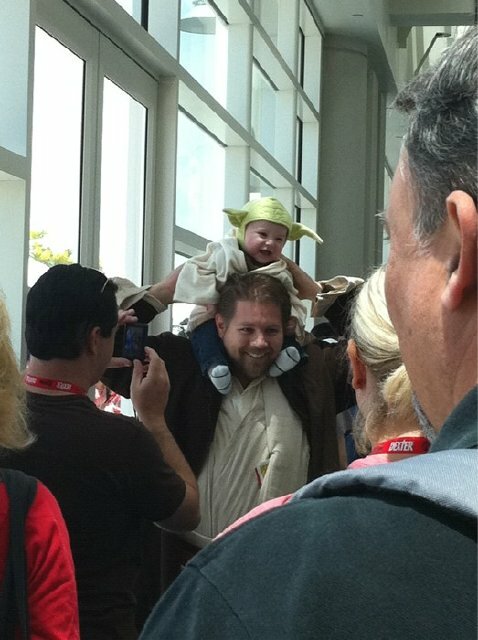 However, the costumes are adorable; specially the baby Yoda. 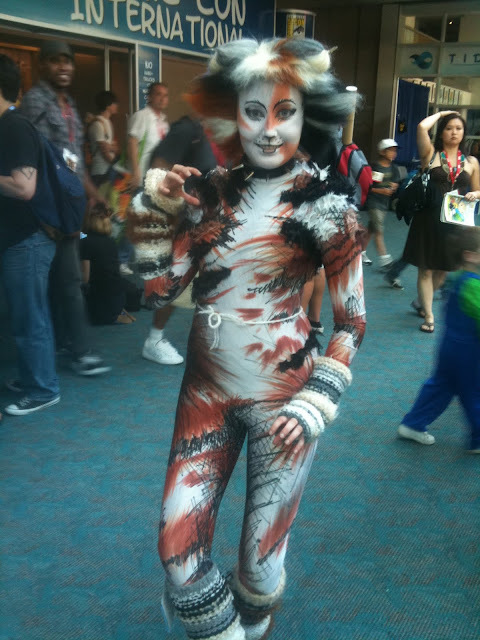 And it's really not a great job on the makeup - the show makeup is way more detailed. She did a very lazy kitty nose and lip. How did you get to go to Comic Con? It's my goal to finally get there next year- how do I get tickets? Stop, woman, why would you stop....? 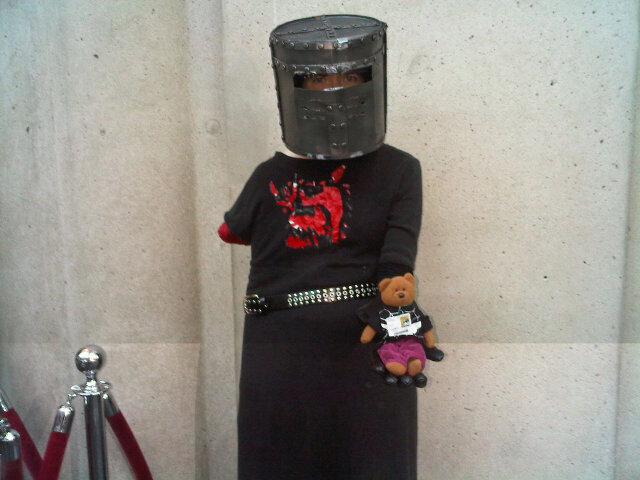 Keep the Comic Con love coming, this is awesomeness. 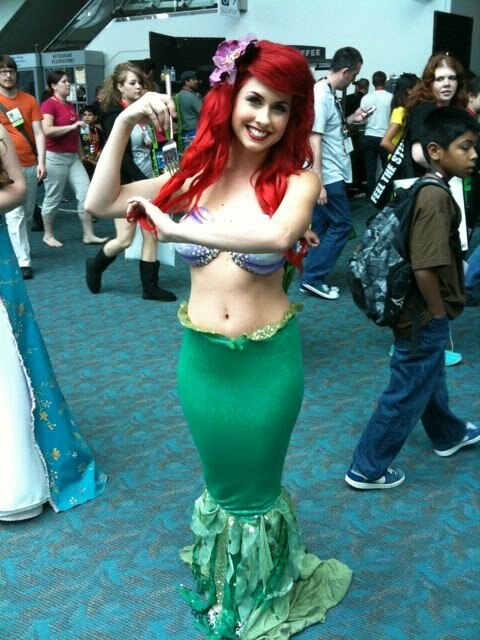 I think Ariel and her fork are going down in my favorite Disney dress up list. Ambiguously Gay Duo makes me weak! Those guys are awesome! WV: coman: i miss seeing the ambiguously gay duo on the coman obrien show. Has anyone ever seen a Star Trek the Next Generation lunch box. I've only seen original series boxes. Does anyone know if any Next Generation ones were made? Baby Yoda is my son. :) Thanks everyone for the compliments!! My favourite form of Comic Conm stalking was following Andy Ihnatko on Twitter. 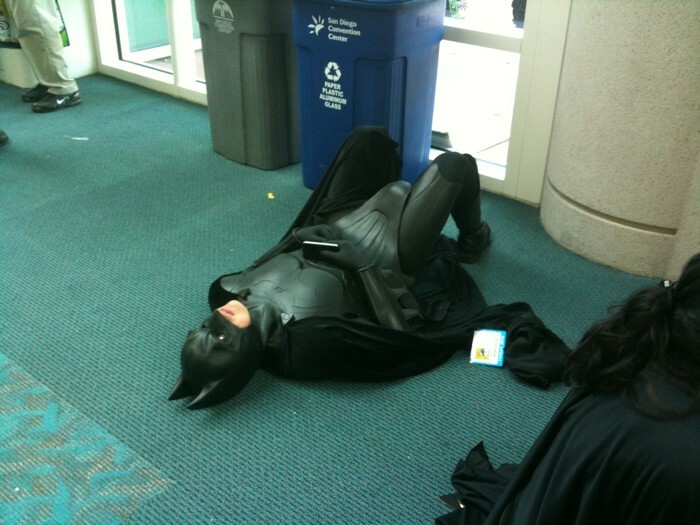 He did a great #sdccMom thread. don't you mean, "Moichandising! Moichandising!" ala Mel Brooks in Spaceballs. wv: sycnz. a funky way of spelling sickens. or a mispelling of synchs. Aaawwwwwwwww... baby yoda so cute. In the picture of tin lunchboxes to buy I bought the Star Wars one with Luke Skywalker and the rest of the gang on it for my husband last year to put his lunches in when he goes to work. He's a Star Wars geek. If I remember right they have a "Dark Side" version too but it had the new Anakin from the third movie on it so I didn't get it. I got the one with the old school Star Wars on it. They had it at Fred Meyer for a bit. They might still have it. Thought *I'd* comment. ugh. And yes, I do go back and proofread late-night comments I make on websites.